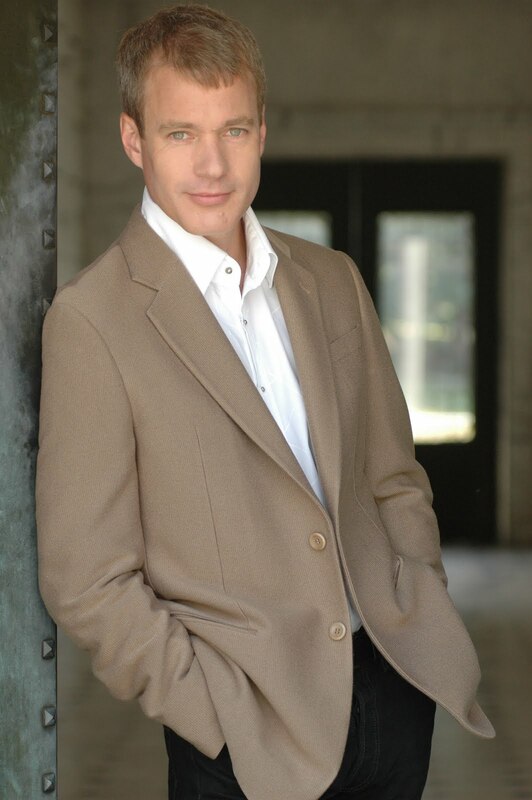 Today we hear from baritone Philip Cutlip, who performs the role of Enrico as part of the Friday/Sunday cast of Lucia di Lammermoor. 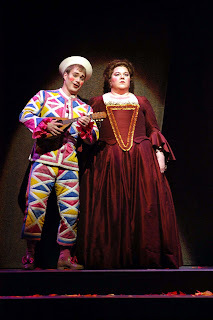 Cutlip has previously appeared at Seattle Opera as Harlequin in Strauss’s Ariadne auf Naxos, Maurice in Jake Heggie’s End of the Affair, and Marcello in Puccini’s Bohème. We had the chance to ask Cutlip about his ties to Washington, his thoughts on this production of Lucia, and how he feels about playing Lucia’s controlling brother. You grew up in Ellensburg, WA, but now live in New York. Do you still have family in Washington, or visit your hometown? It's true—I am an Ellensburger! In fact, my family moved there when I was less than two years old, so I consider myself the next best thing to a native. I grew up in Ellensburg, and spent summers there during my college years when I was at the University of Puget Sound. I finally moved away for good at 22 and have lived on the East Coast ever since. My parents are still in Ellensburg, my father having just retired from 40 years as a mathematics professor at Central Washington University. My mother was a speech therapist in various capacities. My brother and family live in Vantage, my sister and family are in Wedgewood, Seattle. She's been a pharmacist at the Bartell drugstore in Ballard for over 25 years! I love my times in Washington, whether for visits, or in conjunction with singing jobs. Though I've lived in New York City for nearly half my life now, I'll never consider myself a New Yorker. Washington’s outdoor activities and beauty are simply a part of me, and I hope someday to move back here. Let’s talk a little about Enrico, your character in Lucia di Lammermoor. To the audience, he isn’t the most likable of guys. But how do you feel about him personally? Can you empathize with him? Let's just say Enrico is complex. He seems to be monomaniacal, driven to restore his family name at all costs—even at the cost of his sister's sanity and life. And even more significantly, his attempts to manipulate Lucia's relationship in order to turn the tide of his family's fortunes backfires, and we can only imagine poor Enrico falling on very hard times after the opera's conclusion. I empathize with Enrico's drives, but not with his willingness to compromise everything to achieve them. His remorse comes far too late for poor Lucia, even when he is temporarily swayed during the opera's famous sextet. What is your approach to roles like this, for characters the audience is inclined to dislike? Do you enjoy exploring the darker territory, or would rather be the hero? In fact, I haven't played so many purely “bad guys.” I have played roles whose virtues are questionable, whose motivations are dishonorable. Take, for example, Don Giovanni. He is both a magnetic and a hateful character. The challenge is, first of all, to show the facets of Giovanni's character; he is not simply bad or evil. He has weaknesses, but he also has the capacity for love—fleeting though it might be. There are, of course, more black and hateful characters, like the villains in Les contes d'Hoffmann, Méphistophélès in Faust, etc. So far, I have taken as much pleasure in my darker roles as my heroic ones. Variety keeps life interesting as an artist, too! As far as music is concerned, what is your favorite part of Lucia to sing? Enrico's principal scene is the most challenging and the most rewarding for me. It has his aria, “Cruda, funesta smania,” and the cabaletta, “La pietade in suo favore,” both of which are tremendously rewarding to sing and to act, as well. I also very much enjoy the duet section with Lucia—a chance to be really “bad,” and also to sing some extremely beautiful music with my Lucia, Davinia Rodríguez. And of course, the Sextet is truly a masterpiece, with each character expressing his or her own feelings, Enrico's being significant in that he is for the first time showing some remorse and pity for Lucia's situation. You made your Seattle Opera debut as Harlequin in 2004’s Ariadne auf Naxos. 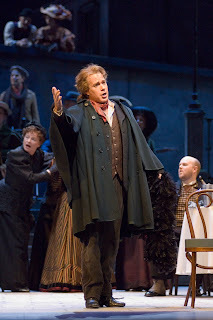 Enrico in Lucia is, vocally, a heavier role. How have you felt your voice evolving since your debut? I’m very pleased to look back at my progress vocally and as a stage actor in the past six years or so since Ariadne. My voice has indeed gained in strength and breadth since that time, and I am so pleased that Speight Jenkins expressed his confidence in me by giving me this Enrico. Now that you’re into the third week of rehearsal, what are your thoughts on this production and its cast? I feel very fortunate to be singing with an extremely accomplished cast. From the young artists singing supporting roles to the principals, I am surrounded by excellence. Davinia is a dream to listen to, and I have no doubt that this Lucia will be the first of many for her. I have really appreciated Bruno Cinquegrani's sensitive musical direction—he is a singer's conductor, who knows what we need in terms of phrasing and breath. The production itself provides a different take on the traditional Lucia setting, but without completely removing it from a basis in historic British territory, and I think it works very well to preserve the feeling of aristocratic tensions required by the plot. I think the set itself—a multi-tiered structure with spiral staircases and ample hiding places for eavesdroppers—will also provide a great thrill for the audience.